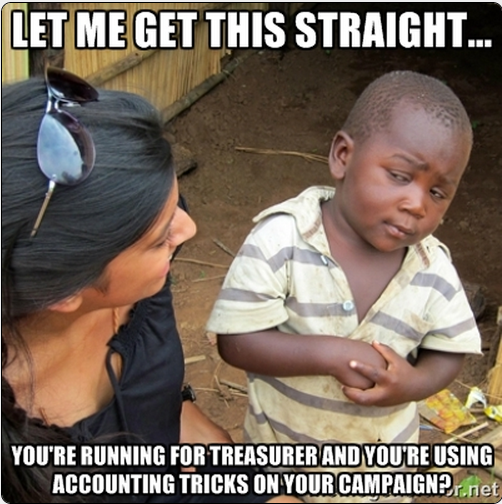 Questions Surface About Treasurer's Candidate Bob Grogan's "Enron-Style" Accounting Tricks? Illinois Treasurer's candidate Bob Grogan can't be waking up to a happy morning with the questions coming from the Illinois Review and the ribbing coming from CapFax commenters. All of this negative attention on Bob Grogan comes because it appears he deposited $50,000 into his campaign account a day before the reporting period ended. Then a few days later - after he was able to 'puff up' his campaign account - he quickly took the money back. DuPage County Auditor Bob Grogan made a $50,000 loan to his GOP primary campaign for state treasurer on September 30, 2013 and five days later, he paid off the loan to himself. Writing a $50,000 check on the last day of the third campaign filing quarter allows a candidate bragging rights on the Illinois State Board of Election D-2, but paying back an obligation within five days without another sizable and comparable check coming into the Grogran campaign from elsewhere raises eyebrows. ...With the $50,000 donation on September 30, Grogran was able to report $70,209.41 on hand at the end of the third quarter. During the last three months, he reports raising a little under $10,000. However, with the $50,000 check he wrote back to himself on October 4th, he lists $58,870.53 in total expenditures during the last quarter. ...In addition to the $50,000 Grogan loaned himself in September, he also lists $27,400 in other outstanding campaign obligations to himself that remain unpaid. And he wants to be our State Treasurer?